Have you ever heard of the Wilhelm Scream? If not, you will after viewing this compilation. 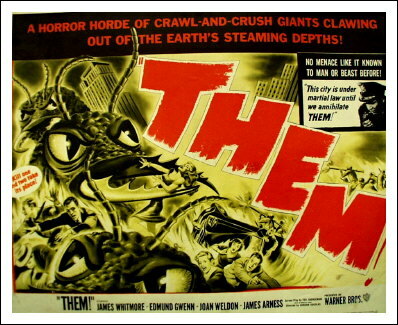 As a side note, look for the scenes from the 1954 movie “Them.” Back in the day, as a boy the big treat was to stay up late on Friday night and watch the Late Show with my dad if it was a war movie or monster movie. Well, Them scared me half to death for some reason and my mom got all over my dad for letting me watch it. But c’mon, getting eaten by a giant ant is pretty scary stuff and you’d do a Wilhelm scream yourself if one of them got you. Check under the bed. I did. It’s true about my mom. she was all over my dad for the “Them” movie night terrors I had.I got banned from the late show for a while but it was too late, the damage was done. You can probably tell.